I just moved into my home, and I have a rust problem in the bathroom! 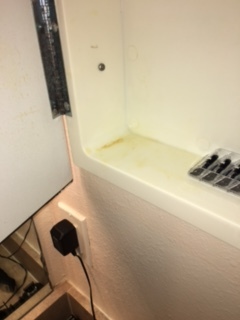 On the edges of the bathtub, and in the medicine cabinet there are some pretty tough rust stains. It looks like they are from shaving can bottoms or something. I have tried multiple things to get rid of these stains, and nothing has worked! In each scenario I used a washcloth and/or a scrubbing brush. The stains are a tad lighter, but still very apparent (pictures attached). Can someone please provide me with a PROVEN solution?? 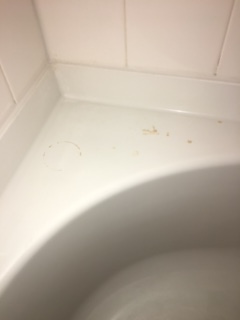 Comments for Bathroom rust stains that won't go away! I used the vinegar and sponge, and it worked!! The stains are still faintly there, but you cant see them unless you intently look for them. Thank you all so much for giving me a REAL solution to my problem! You guys are awesome!! Yes, I was also going to suggest vinegar. You can also try Iron Out. Just make sure you give it enough "dwell time" - especially with the vinegar. I don't know what the right amount of time is to let the Iron Out sit on the stain. But with the vinegar, the longer, the better. Good Luck! 1. Clorox 2 or Vinegar: Just pour either product on the stain and let it sit. Then scour gently with a damp sponge and rinse. You may have to repeat this several times to completely remove the rust. But it should do the trick - without scratching either surface. 2. Use Whink Lime & Rust Remover or Whink Lime Buster. Both work to quickly dissolve rust and hard water stains on bathroom surfaces without scrubbing. Good luck - and please let us know which one works best for you. Thanks for writing!